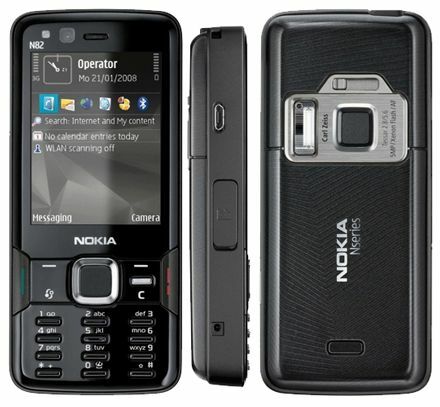 After months of looking for a new cell phone I finally made a decision on it’s replacement, the Nokia N82. I have used it now for several weeks and thought I would share my findings. I have tried a few different brands of phones in the past but always seem to come back to Nokia, they just seem to get it right. My last phone, an old N80, serverd me well for about 3 years, which is pretty amazing considering how fast technology changes and improves. But honestly there was nothing else about that could beat it. For an all round smart phone the Nokia N82 is hard to beat. After experiencing the Symbian 60v3 platform it’s hard to go back to another operating system. Especialy WIndows Mobile which crashes far too often and you can’t even rely on the alarms on a WM phone, it’s a shame because support for WM is huge. There are also a shed load of apps now for S60, almost anything you want you can get, even a spirit level! Having bad mouthed WM I have to say that the S60v3 crashes from time to time but it is extremely rare, I guess any tool this complex is prone to the odd lock up. By far the main reason my N82 crashes is a problem when you search for WiFi spots. You get a System Error message and have to remove the battery to recover and hard reboot the unit. This may be addressed by the new firmware update that came out recently but I have not yet installed it. I could not get the N82 via Vodafone, who are my carrier, so I had to opt for the SIM only contract and buy a phone from a third party. If I brick it I am pretty screwed. So waiting for a month or so before upgrading, let other people test it out first. So what other faults are there? I would have preferred a sliding phone just so that it had a smaller form factor but the phone is still pretty small. It has rather an odd keyboard design with tiny thin buttons but still usable, a ‘normal’ keypad would have been better. The N95 addresses these issues nicely, but lacks a flash and removable data card. Also battery life is OK but not great. It will generaly last a day and a half before needing a charge. However I use it a lot. Not that much for phone calls but web browsing, music playing, checking email etc. And thats all I can realy fault on it. A neat trick the phone does is reading 3D barcodes. If you see one of these on a poster, magazene or website etc it can be read by the phone which can then store the text and act on it. Makes it easy to download a piece of software as it’s a point and shoot system. If you pointed a N82 at the barcode to the right it would take you to my blog. The mini USB connector is very handy as is the removable MicroSD card. So on to other features. The on board GPS works extremely well. It even gets a lock in a leather belt holster under your jacket whilst walking about in the urban canyons of London. You do have the option when you take a photo to geotagg it. That is when you take a snap it embeds the location information in the photos meta data. Very handy. I was a bit concerned that the on board GPS would only work with Nokia software, however it has so far worked with all sorts of 3rd party software I have tried except, unfortunately, Tomtom. To get this to work you need to use a Bluetooth GPS. As I have a small one on my keyring it’s not that big a deal. Google Maps works extremely well on the phone, even if it can’t get a lock off the GPS it uses cell sites to fix your position. So when it first boots up it knows roughly where you are, say 1km radius, then after a few seconds it gets down to 500m or less, then as the GPS kicks in you are pinpointed. Very neat. And the GPS does not take very long at all to get a fix, even in built up areas it tends to get a lock within 10~20 seconds or so. I have not used the built in Nokia mapping software very much at all, it’s something you have to pay for on a monthly basis and as far as I can see Google maps does a better job and it’s free. I think the only advantage of Nokia maps is that you can pre-cache maps. So if you are going on holiday you can load all the maps you may need and therefore not pay for downloading maps on the fly. There is a very nice freebie software called Sports Tracker that you can get your phone to monitor your speed whilst Cycling, Walking Running etc and give you top speed, Distance, average and upload this info to a web site where it overlays your workout on Google Maps. You can share this information and even broadcast it live as you are exercising! When you chose walk or run it also uses the accelerometer as a pedometer. Very neat and a great use of all the toys built into the phone. One of the major reasons for buying this phone, and not going for the N95, was that it has a removable data card and an honest to goodness flash. Lots of phones say they have a flash but it’s only a bright light. The Nokia N82 has a proper Xenon flash, which is essential for indoor photography. If I go on holiday I take my sub-SLR camera with it’s large lens, fantastic quality sensor, optical zoom and hundreds of neat tricks to get you that perfect shot. However when going out to a BBQ, drink etc you don’t want to take a big camera with you. A phone is already with you and is the perfect tool for these occasions. The only thing that lets them down is that they cant take photos inside. Not anymore. OK so this phone has a 5 Mega pixel chip, nice. However as I have said before thats only part of the quality equation, another large part is the optics. Thankfully this phone has Carl Zeiss optics which is sorta like the canon optics of the cell phone world. Given enough light this phone takes one of the best photos a cell phone can. It’s not going to replace a medium priced dedicated camera but it will give some cheaper digital cameras a run for there money. When you take a photo the phone can easily upload it to Flickr, Photobucket etc. If you have turned on the geotagging function it even places the image on a map. Extremely useful. Video is OK, not much of an omprovement over the N80, 640 x 480 @ 30fps. I wold have preferred to have an option for more quality though. The image looks too compressed even at it’s highest quality. But I think I am spoiled by my home cinema setup so nothing less than HD looks right these days. There is no light on the phone, nice flash remember, so shooting video inside is sometimes a problem. Macro is now automatic. On the N80 you had to select macro and I usualy ended up forgetting to switch it back to normal. Music and podcast playback on this phone is much improved from my old N80. The N82 now supports podcasts off the bat. If you are listening to a podcast and stop it, listen to some music, watch a video, go to bed and come back the next day and select the podcast again it picks up from where you left off. Extremely handy. Also works the same for audio books. The headphone remote also works better. On my old N80 if I stopped or paused a music track it often would not start again via the remote, you had to fish the phone out and press play on that. No such problem on the N82. Album art is also supported now which although not essential is very nice. With an 8Gig MicroSD card in the phone you can store a shed load of music and video. The headphone jack, which is a proper 3.5mm jack plug works a treat, you can use any headphones with them. The jack also works with the Nokia remotes and doubles up as a video out. This means you can plug the phone into your TV with the cable supplied. Great idea. I loaded an application called SmartMovie from Lonely Cat that compresses video down to the phone, very easy and quick. I prefer this to Nokias own built in encoder/player as this app picks up from where you left off. The built in web browser is fantastic. I used to use Opera Mini on my old phone because it worked so well formatting web pages designed for the big screen down onto a small screen. However the browser on the N82 works great with most sites and has appeared to learned a few tricks from Opera. Also with the accelerometer you can easily place the phone in landscape mode which sometimes makes browsing sites easier. The Nokia browser also remembers my passwords OK, the N80 version was always forgetting them and as I use high entropy passwords this was a constant headache and another reason for using Opera. I use email with Google and you can get the phone to poll your account for new emails, basically push email. This works extremely well and uses very little bandwidth. Roll over Blackberry. Check this link out for a guide on setting up push email on an N82. One thing I would like to see is a global connection setting. You should be able to set up a string of connection that the phone automaticaly cycles through. ie if you select the browser, Podcasts, YouTube etc the phone should first try and connect to your home WiFi, if this fails, Work Wifi, if no joy any free WiFi then and only then select the GPRS option. Some apps have this built in but it sould be a global setting IMHO. So in summary. If you want a smartphonewith everything on it look no firther than this phone. I like my legendary N96. I found your blog on google and read a few of your other posts. I just added you to my Google News Reader. Look forward to reading more from you in the future.